Bring together up to twenty two of your nearest and dearest in a stunning Georgian lakeside house. When you’ve had your fill of views and adventure, light the fires, open the wine and gather together. Enjoy every moment of your stay, whatever your desire for food and drink, we can help. The house has ten stylish en-suite bedrooms comfortably accommodating up to twenty. Stay in the UK’s Adventure capital. Hike the hills, sail the waters, canoe, and climb. Bristowe Hill. 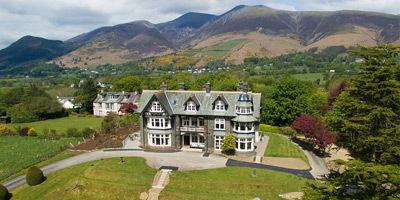 Elegant Edwardian mansion in the Lake District with mountains of charm. Sleeps 16–20 people.